For some reason I seem to be more directionaly challenged in Iceland than at home. I can't explain it. Perhaps it has to do with the fact that we are so much farther in the northern hemisphere and compass directions are more difficult to discern by the sun. 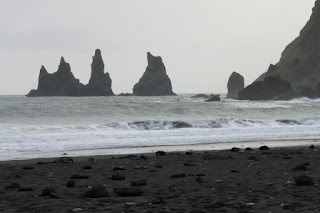 I keep thinking we are on the east coast when really we have moved to the southern part of Iceland. Our drive this day was only projected to be an hour and a half without stops but we managed to stretch it into a full day's worth of travel. 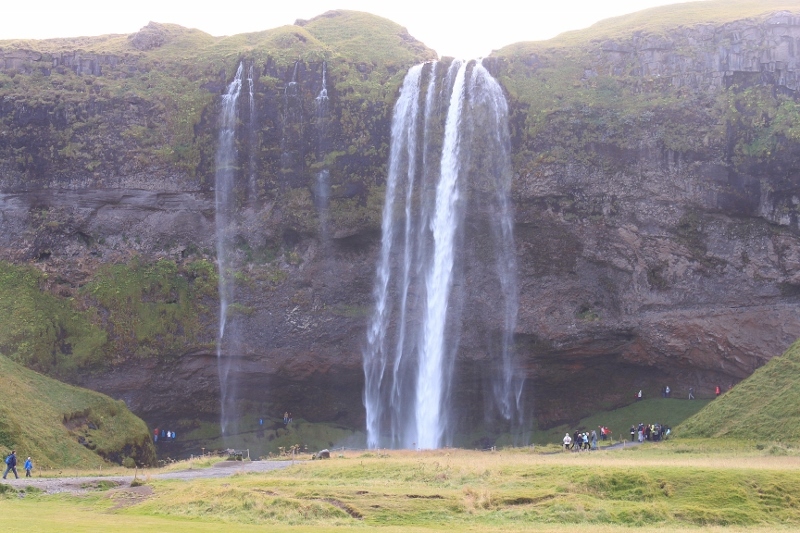 Including several waterfalls, a trek to a DC3 plane wreck, a glacier, and a nature preserve with a black sand beach. 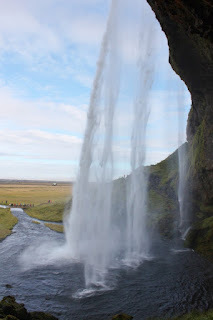 Every waterfall has a significant label. One is most voluminous. One is highest. One is most spectacular. Another most beautiful. I don't know how they distinguish but each has its own brand. 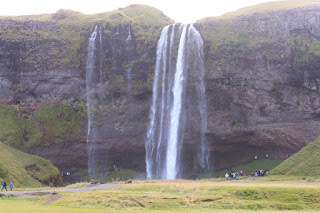 We stopped at one where we were able to actually walk behind it, Seljalandsfoss. 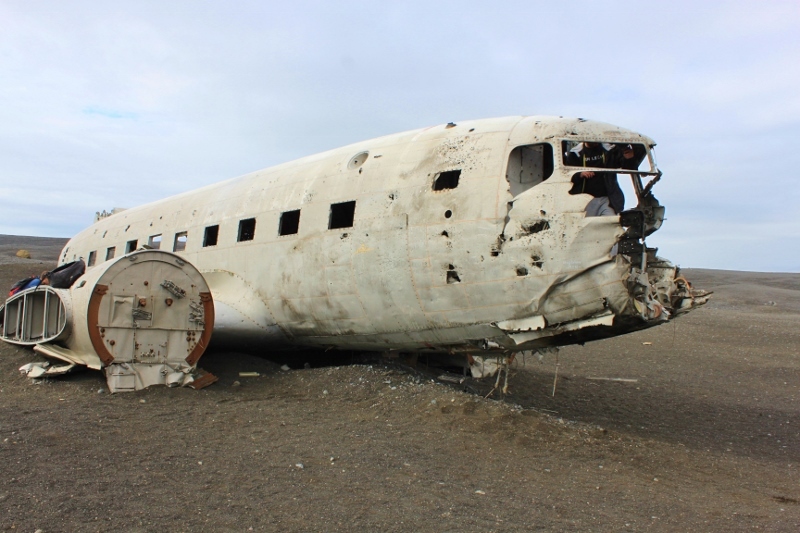 Between waterfalls was the visit to the wreck of a DC3 Navy plane on Sólheimasandur’s beach. Back in 1973 the plane ran out of gas (although another account is severe icing) and crash landed there. All of the crew survived so at least it was not a memorial site we were visiting. Of course as the supposed 1.2 mile hike turned out to be 2.5 miles one way we began making jokes about gathering enough stones by the wayside to use as markers for our untimely grave. 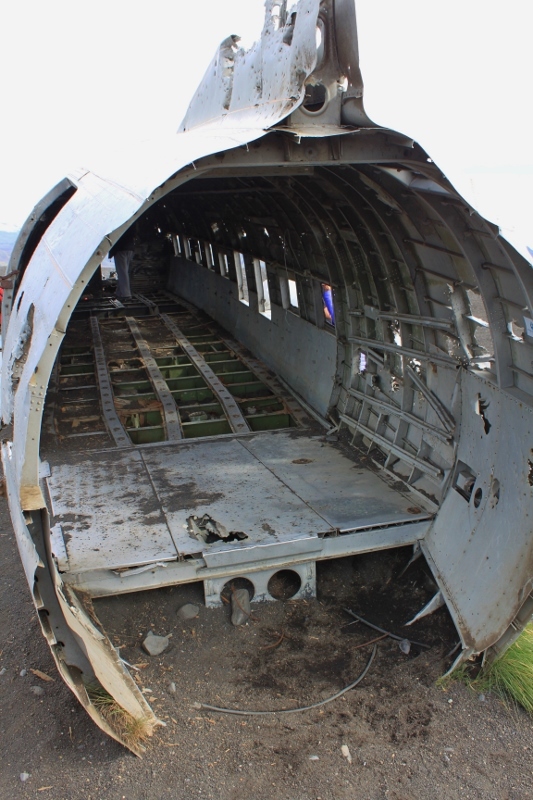 Thank goodness all but the last little bit down to the fuselage was level and the sun was clouded over keeping the temperature cooler. Otherwise it could have been very uncomfortable. As it was, this was the first time since leaving home I actually got warm enough to sweat (make that glisten--women glisten). So two hours of our day were spent making our way to a small part of a fuselage minus wings and tail of a plane that was already totally gutted I'm sure by scavengers. But it was interesting and it did give us a good workout. Since it was past noon, we opted to lunch on the bananas and peanut butter I had stored in the back of the car. We were too far from any place we knew of to get lunch and too hungry to take a chance on finding anything quickly. It satisfied the hungrys and we went off to see the glacier. I could only hope it wasn't another long walk. My legs and feet were screaming at me. 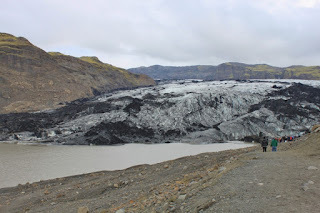 Thankfully the Solheimajokull glacier was not too far down a trail that was a little up and down but easy enough to navigate. We were passed up by two groups with climbing gear in hand and helmets on heads prepared to go to the top of the glacier and walk around. As we neared it we could see groups of people up on top of the glacier already. 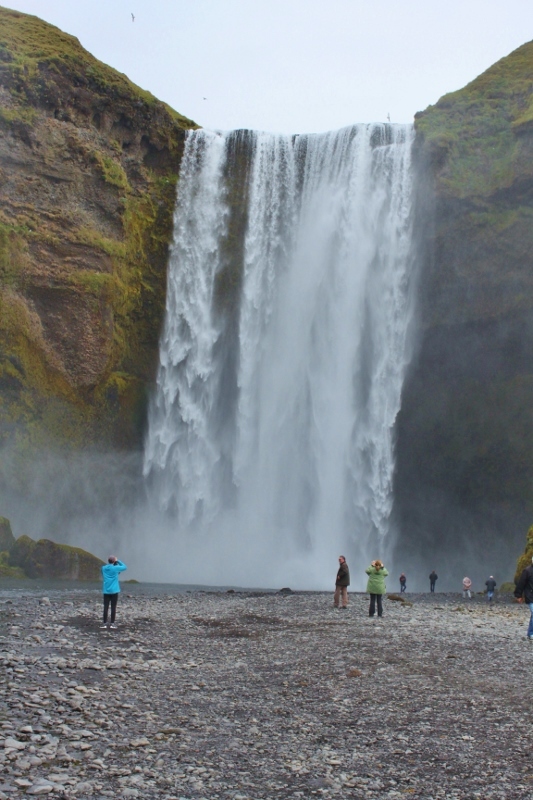 On our visit to yet another waterfall, the Skogafoss, we found time to enjoy a cup of coffee and a rest stop at the nearby restaurant. Did I mention how good the Islandic coffee is? I don't know the brand but it was consistently good along the way. That was good news and bad since you wanted to drink more but "rest stops" were quite a distance from each other. There were few public toilets but you could usually find a cafe or restaurant where either for a fee or the purchase of something, you could use the facility. By the time we got to Dyrholaey or Doorway Hill Island, the wind was kicking up and there was a light mist changing to a drizzle. My pictures look like I shot them in black and white but there was little sunshine and the rocks and cliffs were so wet the lava was a dark black. 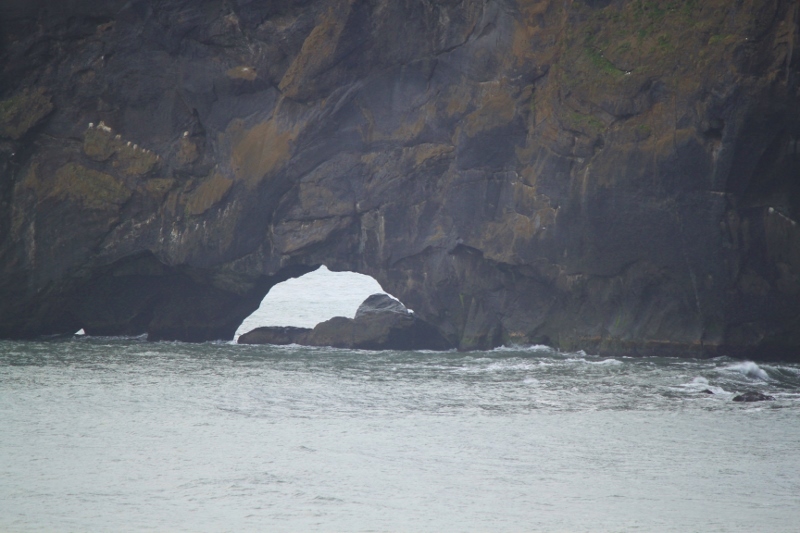 There were supposed to be puffins somewhere in the area but it wasn't evident where they would be. We guessed somewhere down on the black sand beach which was closed at that point because of the surf. An arch in one area of the lava formed cliffs can be passed through by boats and even small planes if the tide is out and the conditions are good. This day it would have been suicide for either with the wind and the waves. 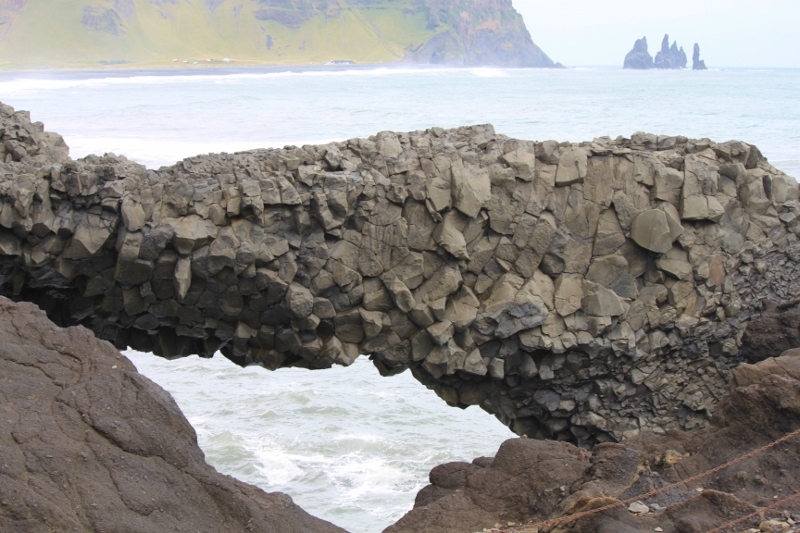 There were some interesting lava formations and we took a few more pictures before deciding we would head for the town of Vik and find something more for lunch. It was already 3 o'clock but we knew dinner would not be until 7:30 at the place we were staying so a late lunch was in order. We found a TripAdvisor recommended restaurant, Sudor Vik. Bob ordered soup but I still wasn't very hungry. They had a small order of breadsticks with pizza sauce dip and I opted for that. It turned out to be really good. Their pizza sauce was obviously made from fresh tomatoes. I almost wished we could go back and order a pizza later. Down the street we found another black sand beach and walked along it for a bit still looking for the elusive puffins. Every place in the world we have visited where they are supposed to be we have always missed seeing them. It would be the case again this day. While we saw some nests high up in the rock it turned out they were not puffin nests. As we walked back to the car it began to drizzle a little more again and with the wind kicking up it was getting a little miserable. We both sat down in the car seat and said, "I'm done." A ways down the road we had already passed our hotel for the night, the Volcano Hotel. 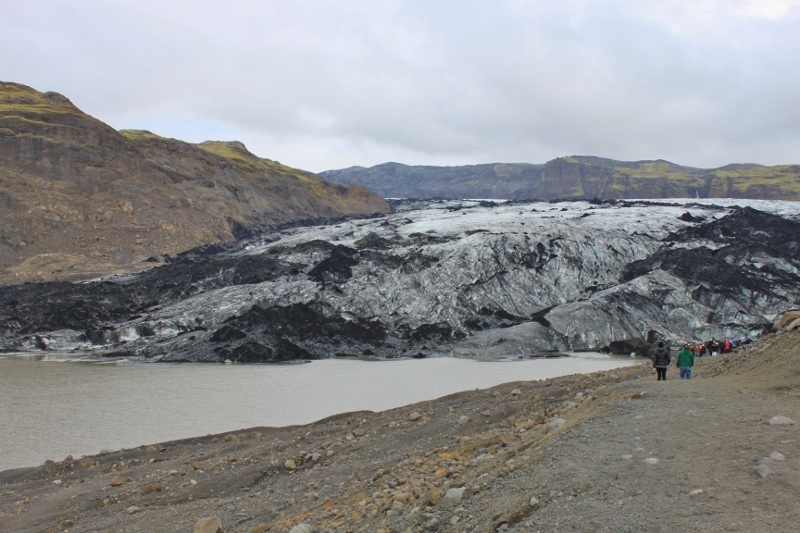 Did I mention we were staying at the base of Katla, the volcano that just the week before was said to have sent off tremors and rumblings. Ah, what would the night hold? The Volcano Hotel calls itself a boutique hotel. It only has seven rooms. From the outside it doesn't look like much but the inside has what they call a volcano rock floor in the common area. It looks like Nature Stone flooring. Nicely decorated but still in the simple style of Icelandic decor--light hardwood floors in the rooms, simple lines in the furniture but the most welcome sight was two wash cloths on the sink. Most places outside the US do not have washcloths. We had emailed ahead that we would take advantage of their dinner offering. They will make dinner for their guests at an extra cost but you have to take whatever they are making for the evening. We had seen some of the offerings on TripAdvisor and thought that most anything they made would be okay with us. 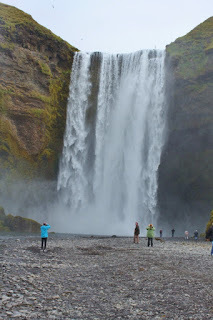 It sounded better than having to travel down the road again in the rain and find a restaurant seven miles away in Vik. We were so glad we did. The meal was absolutely delicious. It was Arctic Charr which is a fish that is a little like a salmon/trout mix served with some salad, boiled baby potatoes and a mix of veggies that were sauted. It was accompanied by homemade bread and followed up with an ice cream or Skyr dessert. The Skyr is an Icelandic yogurt. It is not as creamy as most yogurts and our server gave us a pitcher of cream to add to it. The flavor was blueberry but it was not sweet at all. But now we can say we tried Skyr. We ended the day wondering if the clouds would clear enough for the Northern Lights. Our guess was no and the website (www.vedur.is) for predicting it was not promising anything either. So, as I climbed into bed I wondered: do I set the alarm for midnight again to see if the sky is green or just give it up for the night?